After the twilight race at Mid-Ohio, there's been some movement in the Power Rankings...and while provisionals can hurt, this list is more about exceptional weeks and seasons, and giving credit where it's due. So now, I give to you, the updated Power Rankings!! Let the debates begin!! 1. Leif Peterson - Holding onto the top spot, Leif had a second place finish, but continues to finish on the podium. With a second place finish, his average finish this season is now 2.7!! He has a firm hold at the top of the points standings as well, but it's not over yet! 2. Clark Archer - With another win at Mid-Ohio, his third of the season, Clark moves up into second in the rankings this week. With his average finish now a class best 2.5, missing one race has hurt his chances for taking the championship. However, there's racing left on the schedule, and the title hasn't been decided yet! 3. Jason Lundy - With his third podium finish in a row this past week, Jason has been moving up the points week after week, which many of us are not surprised to see. Don't be surprised to see Jason snag a win before this season is over. Like the Pro Class, this division saw a dramatic decrease in entrants at Mid-Ohio, but you can bet on seeing that number climb when we get to Watkins Glen this week. This division has averaged 8.4 drivers per start so far this season. 1. Paul Hamilton - Because of yet another podium finish at Mid-Ohio (his 6th out of 7 races this season! ), Paul hangs on to the top spot in our rankings and in the points. With two races left, he almost has the points title in hand, and just needs to keep doing what he has done all season...be consistent. 2. Jay Dargert - Taking the win at Mid-Ohio, Jay moves up to second in our Power Rankings this week, and his overall average finish for the season is 4.8, with two wins and three podiums out of 5 races he has started. I'll make the prediction now, Mr. Dargert will take the win at Watkins Glen this week based on his past record there! 3. Randy Drumhiller - Randy continues to improve, and moves up a spot in the Power Rankings this week, primarily from his consistency. Starting the season with back to back podiums, Randy has been just off the bottom step in his other four races, and will be tough at the Glen! 4. Anthony James - Despite missing this week's race, AJ's season and consistency, particularly his 3-race win streak of recent, keeps him firmly cemented in the Top 5. 5. Scott Burke - With a second place finish at Mid-Ohio, and a season average finish of 2.75 in 4 races (Taking the win in the season opener at Daytona! ), Scott's a front-runner whose recent podiums pulled him into the Power Rankings this week. Continuing to be the largest class starting the race each week, this division is averaging just over 14 drivers starting each week. That means a bad night hurts just a little more, and a good night feels great. 2. Drew Lidkea - New to the Power Rankings this week, Drew took his first win of the season at Mid-Ohio and moved up in the points standings to 3rd, even after missing the season opening race at Daytona, and tough outings at Road America and Sebring. But with a win and two second place finishes this season, Drew has proven to be a front runner. 3. Peter Hebron - After starting up front, Peter brought his ride home in second place for yet another podium this season. His average finish is now 4.6, but he has found consistency as of late and be out front at Watkins Glen. Peter brings experience each week, and with the chase for the Championship far from over I would expect to see him out front again. 4. Dion Smith - Each week, Dion is always at the top of the speed chart, but hasn't had the luck that goes with racing at times. His third place finish at Mid-Ohio was his second podium of the season, and is one of six drivers to make all 7 races so far this season. Hopefully the bad luck is gone, which is bad news for the rest of the division. 5. Joey Tungale - After back to back podiums in previous events, Joey finished inside the Top 10 at Mid-Ohio on a night that was tough for all. His recent consistency has kept him inside the Top 5 of the Power Rankings this week, and is yet another with the speed to finish on the podium each race. 6. Jay Freels - I would expect Jay to rebound at the familiar Watkins Glen circuit this week, and put this past week's race in the mirror. 7. Larry Ford - With his Top 5 finish in class at Mid-Ohio, Larry has averaged a finishing position of 6.7 in six races this season. 8. David Anderson - Another driver who has made all 7 races this season, his racecraft and patience moves him up through the field nearly every race! 9. David Slee - Dave is one of out long time members that shows up ready to race every week, and has had an up and down season overall. 10. Samuel Scott - With a win and a 3 podiums out of 5 races this season, Sam is another driver that has the speed to take another win. 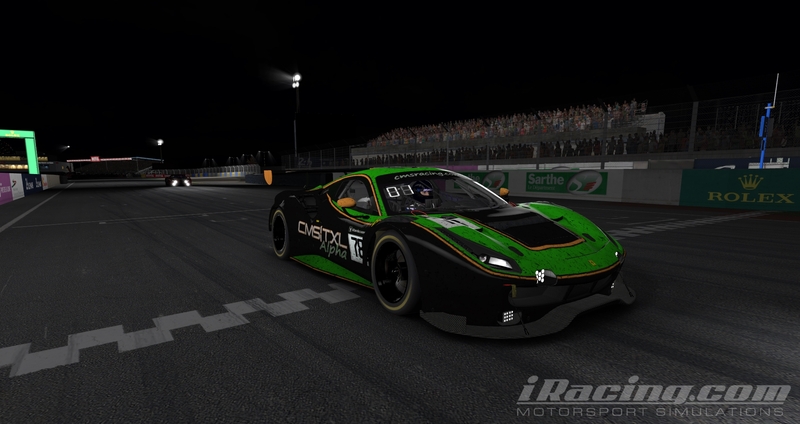 Congratulations to the CMS Endurance iRacing Team and the Alpha Car Driven by Drivers Paul Hamilton and Daniel Johnson for their win at Lemans in the opening round of the 2019 Season 2 iRacing VRS GT3 Endurance Series. A phenomenal result by the team and great start to the upcoming 12 week season. 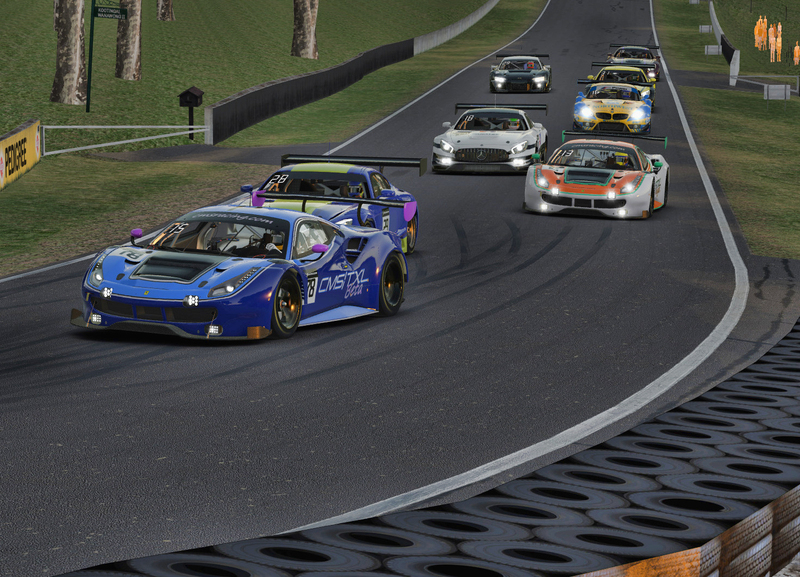 The newly formed 2019 roster for the Endurance Team at CMS couldn't have gotten off to a better start if they had tried with this result and it has left the entire team excited and really eager to get back out and go again at Round 2 Bathurst next weekend. For Lemans the team would enter two cars. the Alpha car driven by Hamilton and Johnson. 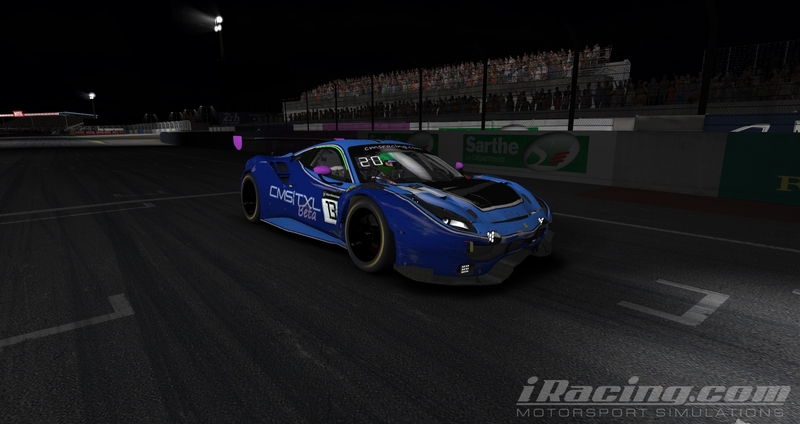 As well the second entry would be a sister Ferrari GT3, named the Beta car, driven by Matthew Overton, James Andrew, and David Anderson. The cars would be destined to be together for much of if not the full first hour of the race. Qualifying 15th and 16th on the grid, both Matthew Overton and Paul Hamilton drove excellent first stints to put the team in great position at the first round of pits stops. Matthew would lead most of the way, with Paul in close pursuit the two drivers working through traffic very well together. At pit stops they were as high as 12th place in the 40 car grid. Handing over to Daniel Johnson in the Alpha Car and James Andrew in the Beta car would setup second stints. 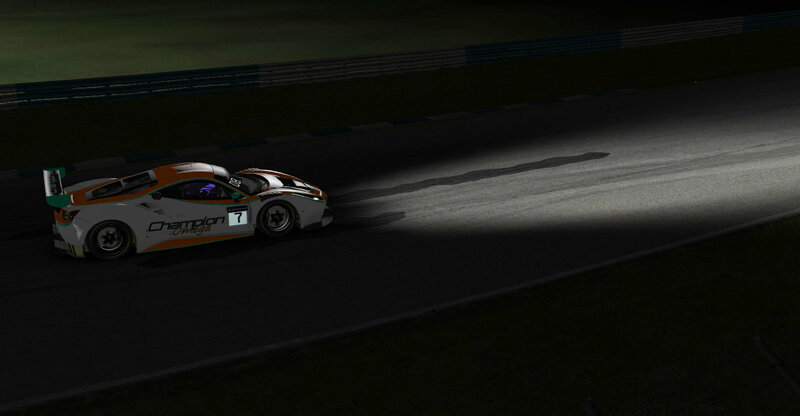 Unfortunately for James Andrew he would be involved in an accident exiting the Porsche curves a few laps into his stint. This would require about 8.5 minutes of repairs on pit road and drop the Beta car out of contention but still running for what would hopefully be a run at a top 20. Daniel Johnson however in the Alpha car began his stint by starting to click off faster and faster laps, each time eclipsing a best and taking PB in the session. Nearing the end of Daniel's first stint he had moved the car into the top 5 and it was apparent we would be competing for the win. Late in the race James Andrew would hand the Beta car off to David Anderson for a final stint. Unfortunately for David and the team after climbing back to 19th overall the Beta Car's Ferrari Powered Engine would expire on the front stretch, ending our race about 10 minutes before the finish. On the bright side as we got to about that same point, Daniel Johnson had successfully moved into the lead and retained the lead after a late splash and go pitstop. Coming back on to the track with a comfortable lead Daniel would cruise home to a victory for the team, our first, and a phenomenal result. The second car would finish in 21st overall. The team leaves Lemans extremely excited about our potential and ready to tackle Bathurst on Saturday March 23rd. We are still accepting sign-ups and participants for this series. If you would like to drive, spot, test, or work in team management with the team please let us know. Rather you are able to run full-time or part-time, let us know if you are interested. The team will field up to 3 cars in the VRS endurance championship for Season 2, races are on Saturday and/or Sunday afternooons in the USA, and UK Evenings, and are 3 hours in length. We will field a minimum of 2 drivers per car and a maximum of 3. The goal and intent of the team is to have fun first and foremost, but also to represent the overall Champion Motorsports/TXL community and do our best in the GT3 Endurance Season Championship. Our focus is all about team, so we will gear our driver assignments and entries each week to the maximum chemistry and performance we think we can achieve for the team championship standings. As drivers are able to participate on a full or part time basis we will look at the upcoming schedule from week to week and determine if we will be fielding a minimum of 1 and a maximum of 3 cars. From there we will help get you started. Also this is meant to be a community fun effort, so in typical CMS Gentleman fashion we welcome all skill levels and we will work as a team to assign drivers appropriately on race day to a car. 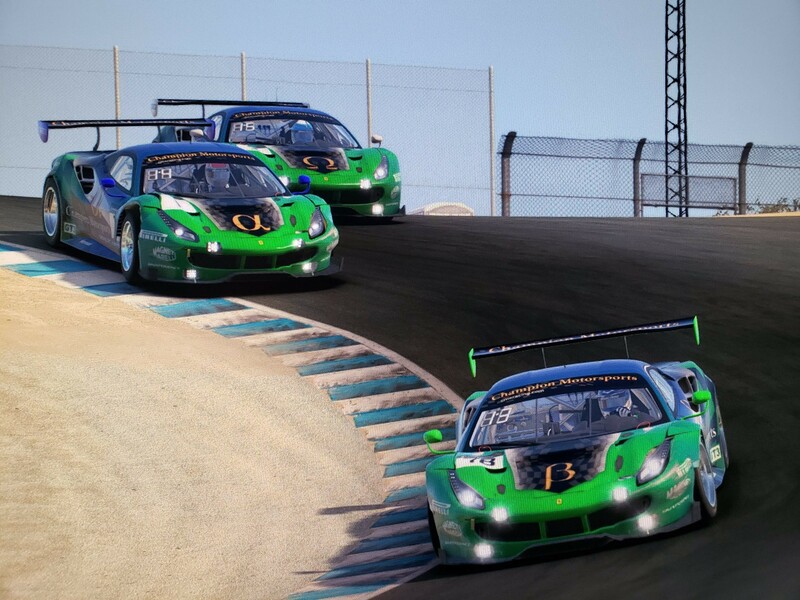 Furthermore we are asking and encouraging existing CMS members that are part of sub teams such as Longhorn Racing, All Balls Racing, Puffin Racing, Can-Am Racing, and others to consider joining us on this Super Set team to help promote simracing and the Champion Motorsports community. As such for this season we will all be running similar CMS Livery Paint Schemes and driving under the CMSRACING.COM team names within iRacing. All drivers for this season will compete in the Ferrari GT3 car.